During the execution of the II United Nations Conference (UN) on South-South Cooperation, which takes place from 20 to 22 March 2019 in the city of Buenos Aires, Argentina. Venezuela reiterated its claim to the ruthless economic blockade that imperial powers apply against it. 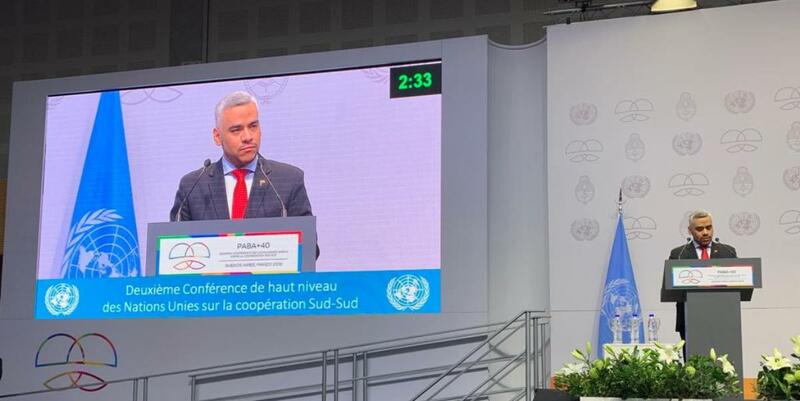 Juan Valero, charge d’affaires of the Bolivarian Republic of Venezuela in the Argentine Republic, stressed that “in a multipolar world South-South Cooperation should not be subject to the approaches of developed countries, nor considered as a substitute for Official Aid to the Developing”. Similarly, the Venezuelan diplomat reiterated “the illegal application of unilateral coercive measures to which our country is subject today in flagrant violation of the purposes and principles enshrined in the Charter of the United Nations”. Likewise, Valero referred to “the systemic and unprecedented attack on the oil sector, the main source of Venezuela’s public revenues. The assault on the assets of the oil subsidiary of Pdvsa, located in the United States, amounts to more than 20 billion dollars”. For his part, the Charge d’Affaires declared that “the Bank of England, in an act of colonialist robbery, stole the gold reserves of the Venezuelan people estimated at more than 2 billion dollars”. In this regard, Valero said that “Venezuela has never before experienced such a ruthless attack on its economy, its right to development and the human rights of its population. So far our country has lost more than 24 billion dollars as a result of these actions”. Followed by this, the Venezuelan diplomat said that “despite these attacks on Venezuela, the Bolivarian Government works actively with the System Agencies in multiple areas, taking into account the priorities established by the 2030 Agenda. Since we believe in the integrating nature of South-South Cooperation, based on direct, horizontal, voluntary and non-politicized relations among nations, with full respect for the different forms of government and ideologies and the principles established in the UN Charter”. Finally, the diplomat said that “Venezuela promotes bilateral cooperation, the strengthening of South-South Cooperation and reaffirms its full willingness to work in this regard. In addition to engaging in concrete actions, without discrimination or coercion, in favor of an inclusive work and without interference in the internal affairs of other nations, in order to restore the spirit of solidarity with a deep social sense”. It should be noted that this Conference was established in Resolution 71/318 of the UN General Assembly, it is expected that the closing plenary session will result in an intergovernmentally agreed final document which will be oriented towards the development of the countries.